An audio frequency induction loop or hearing loop is used to make communication easier for hearing aid wearers. It is a system that is often permanently installed to send sound from a source directly to hearing aids. Because the hearing aid is used as a receiver, this is the assistive listening technology that is most convenient and most effective for end-users where it can be employed. A loop creates a magnetic signal that is picked up by a hearing aid when this is set to its ‘T’ (Telecoil) setting. This technology has been around for many years and is relatively straight forward in its basic form. While simple in principle, a good understanding of the technology and the user’s needs is essential to avoid some common traps in the installation and use of loop systems. Who benefits from Hearing Loops? Why should I provide Hearing Loops? Service providers should provide hearing loops because it is required by law in many places, but also because it will make your goods and services more accessible and raise customer service levels. Good accessibility can increase customer loyalty and generate greater revenue streams. Many countries have strong legislation to require the use of assistive technologies wherever it is reasonable to do so, so services are accessible to all. Without hearing assistance solutions you may be discriminating against disabled people and could face legal action. Other benefits include an improved public image, better customer loyalty, increased brand awareness and good publicity. Electrical instruments such as electric guitars, electric bass guitars or dynamic microphones are used within the area covered by the loop and interference can not be controlled through loop design. Audio Inputs 1, either from an existing audio source such as a P.A. system or from dedicated microphone inputs feed an audio signal into an Induction Loop Amplifier 2. The amplifier drives a current into a Loop 3 or series of loops. As the current flows through the cable it creates a Magnetic Field 4 in the required area – careful loop and amplifier design ensures that the vertical component of the field is even and free of dropouts and dead zones wherever the user might be. 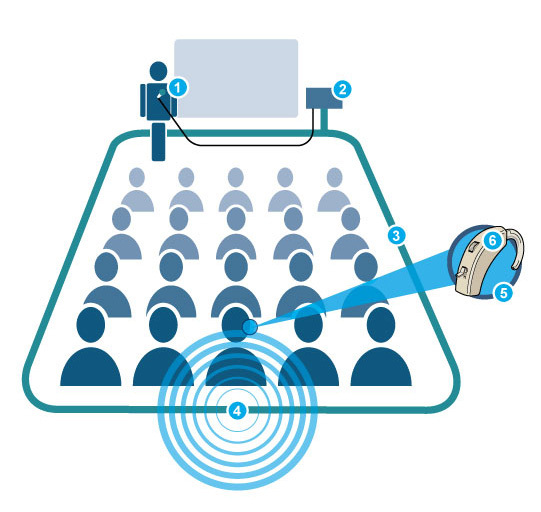 Inside most Hearing Aids 5, a small coil known as a Telecoil 6 picks up the magnetic field signal, which is amplified into a high quality audio signal delivered directly to the ear of the hearing aid user.